Vertical blades comb through a lawn to remove the old thatch that has settled down to the dirt. Promotes a healthy lawn and early start to spring greening. 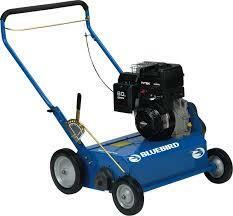 * Please call us for any questions on our power rake 5.5hp rentals in Calgary, Alberta.